I love hanging out at farmers markets, surrounded by fresh, locally grown produce and jostling elbows with people who no doubt are planning to turn the gorgeous greens in their baskets into something amazing for dinner. Although I’m fairly clueless about the art of cooking, I just feel healthier – and smarter – when I’m there. That said, all that healthy goodness can be expensive. Too expensive, in fact, for many families to afford to include it in their weekly grocery trip. But Farmer Foodshare has a plan. 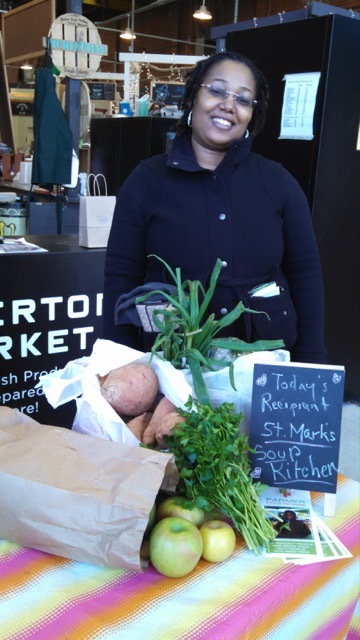 Relatively new to Charlotte, they use donations of cash and produce from Atherton market customers and vendors to provide fresh, locally grown food to local agencies like Friendship Trays and St. Mark’s Soup Kitchen. They also serve as a collection site for Friendship Gardens’ Backyard Gardeners program. Donation Station Shift – Man the donation table every Saturday at Atherton market. They offer three 2-hour shifts between 9 am and 2 pm, with 1 or 2 people per shift. Kids 10 and up are welcome when accompanied by an adult.